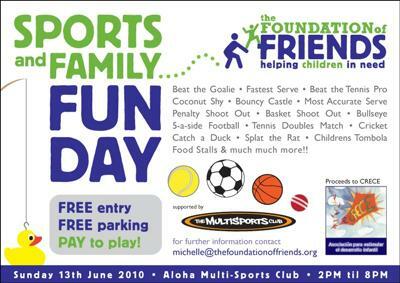 The Foundation of Friends is holding a Sports and Family Fun Day on Sunday June 13th from 2:00pm to 8:00pm at the Aloha Gardens Multisport Center in Nueva Andalucia, Marbella. On the day there will be lots fun, games and prizes to be won which include fun sporting games such as Beat-the-Goalie, Fastest Serve, Most Accurate Serve, Beat the Tennis Pro, 5 A Side Football, Tennis Doubles Match, Cricket, Penalty Shoot Out, Basket Shoot Out and more. Kids and parents alike can also participate in fun fair games such as Coconut Shy, Bullseye, Splat the Rat, and Catch the Duck. Smaller children will enjoy the day jumping on the bouncy castle or participating in the children´s tombola. Food stalls will also be scattered throughout the event with plenty to choose from in food and drink. The Foundation of Friends is encourages the Expat and Spanish community in coming together to raise money for facilities and support to help children who for a variety of reasons find themselves in difficulty. This events profits go to support CRECE - the Association for the Stimulation of Children´s Development. Marbella Family Fun supports the Foundation of Friends and we´ll be participating in this family friendly event. See you there!